Before we begin, let me quickly apologize for my absence these past few weeks. It's been crazy dealing with school work and deadlines. I can't promise that the craziness will end soon as it's really not my call. What I can do however, is promise to steal away whenever I have the chance and come a-blogging. So, we good? Yes? Great! Now back to the poop business, just incase you don't know, there's good poop and there's bad poop. The classification is all based on the form, colour and frequency. FCF if you will. 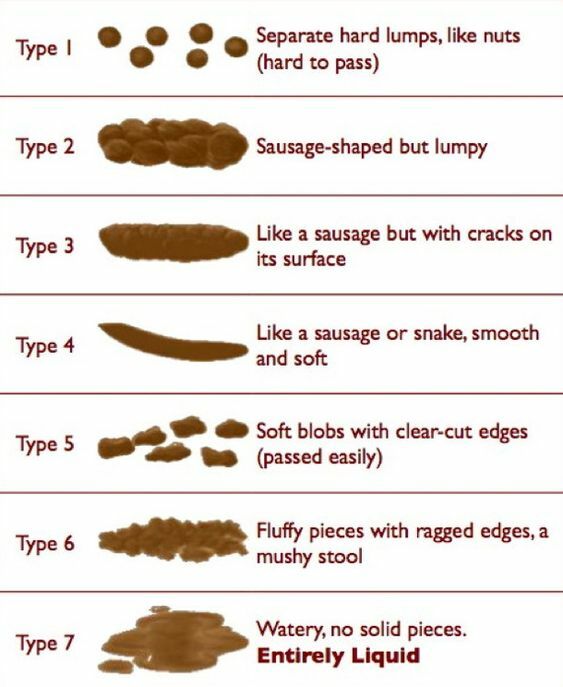 There are actually 7 poopy forms and you want to be smack down right in the middle at number 4, but let's not get ahead of ourselves. Let's take them one after the other. You know those doodies you make when you've eaten too much chocolate? Those ones difficult to expel that eventually come out looking like maltesers? Yeah, those are Type 1 doodies and they are bad, bad, bad! Have you considered eating less chocolate? Type 2 dumps are the rough, lumpy, sausage-shaped ones that have you shifting from side to side in trying to bring them into the world. It makes you feel like the type 1 maltesers decided to stick together and deal with you. But if you think Type 2 is bad, then think again because type 3 is worse! Type 3 poop is the kind that makes you scream blue murder while wondering if you are getting cuts and tears as you try to get it outta ya. LOL! It comes out looking like an extra-large sausage with cracks on the surface. Stay away from type 3 poop by drinking lots of water and eating enough fibre. If it doesn't get better, be sure to see a Doctor. As bad as type 3 might seem, you're actually better off having type 3 doodies than types 5 and 6. But let's talk about type 4 first. Doing type 4 business is easy-peasy-japaneasy. No screams, no tears, no trouble... just some happy-go-lucky pooping. It's all smooth, soft, mushy and sausage/banana-shaped and requires no excessive wiping efforts. If this is your thing, then you're fine. Congrats! Type 5 doodies are similar to Type 4, only softer and less consistent. Instead of one or two smooth sails, they prefer to appear in multiple blobs. Think of an easier version of Type 1 and you have Type 5. Remember those poop sessions that have you wondering if you're done or if there's more? That's right! Those are type 5 doodies. Type 6 pooping sessions are the worst! It's almost as though they haven't quite decided if to stay or leave. They come out ragged and mushy and shy. This is that kind of business where you wipe and wipe and wipe... before you decide to just take a bath to completely get rid of it. We already agreed that you're better of with type 3 than either of 5 and 6. Now let's talk type 7. Type 7 shoots straight out of you with little or no warning. It's all liquid and comes out sounding like a waterfall. It makes you consider camping out in the restroom for a while just to be on the safe side. Anything you eat or drink seems to shoot out a few minutes later so you're forced to do some unplanned fasting. Hehehe. If you want to risk eating or drinking however, Mama Natural recommends the BRAT diet - Banana, Rice, Apples & Tea. Goodluck to ya! The doodie types seem familiar eh? If not, take a look at this Bristol poopy chart, before we start talking about colour. The colour you want is medium to dark brown. Anything else is suspicious, especially if you can't figure out exactly what you ate/drank that might bring about a different colour. So make sure you see a Doctor if your doodies are consistently black, grey, green, yellow, orange, red, pink, purple, blue, turquoise, lilac, fuchsia ...Okay, I might be getting carried away. As for frequency, you want to do your business at least once a day and no more than 3 times a day. Know that big feeling of relief when you've done your business and feel nice and empty? You imagine that you lost a pound or two from the poop session? That's a good poop session right there. Outside that may be cause for concern, especially if you ain't going daily. You're probably not eating enough or eating the right balance of food to move your bowels. Try to drink lots of water and include more vegetables and fruits in your diet. If it doesn't get better, you guessed it... see a Doctor! So, that's the low down. If you want to know what's going on inside you, then look before you flush. Oh, I almost forgot, it appears there are two schools of thought as regards floating or sinking. One school argues that it's better for your doodies to float and the other says sinking is better. What say you? Are your doodies floaters or sinkers? Share in the comments and don't forget to drink lots of water. Okay,this might be the best blog so far. It had me laughing all the way. Who would have thought that reading about poop could be so fun. LOL!